Stabila came to L2 Interactive looking for a better way to showcase the breadth and depth of their product line of high-quality tools. 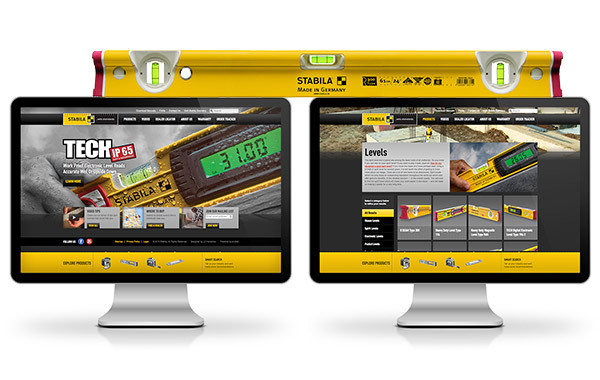 Many professionals throughout the world have come to know and trust Stabila’s specialty measuring and layout tools, but viewing their entire product line, and locating an authorized dealership, was not as clear-cut. With this in mind, L2 Interactive sought to give Stabila a worthy forum to showcase their tools, and to develop some innovative ways to help connect the professional with the product. L2 Interactive strove to feature Stabila’s product line throughout every aspect of the site, including within its design. Bold, full-bleed imagery of the products in use serve as backdrops for all content pages, and help to alleviate the need for heavy copy. 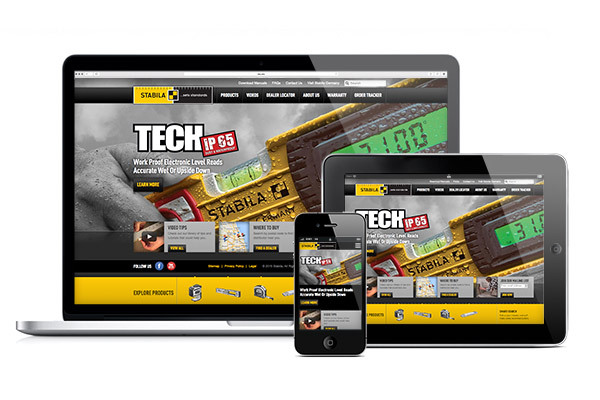 Fully responsive design was essential, as it enables professionals in the field or office to view all relevant product information on any device. Individual product detail pages cleanly display a wide range of relevant product features, specifications, and model information in one unified space. Powered through erube2™ data – L2 Interactive’s site building content management system and application framework – this is one of the first instances that all product information is shown in one place, outside of a printed brochure. The Explore Product Bar is anchored on the bottom of every page, and enables a quick, visual summary of all products, at all times. This function also gives the user the ability to re-start a search at any point while on the site. 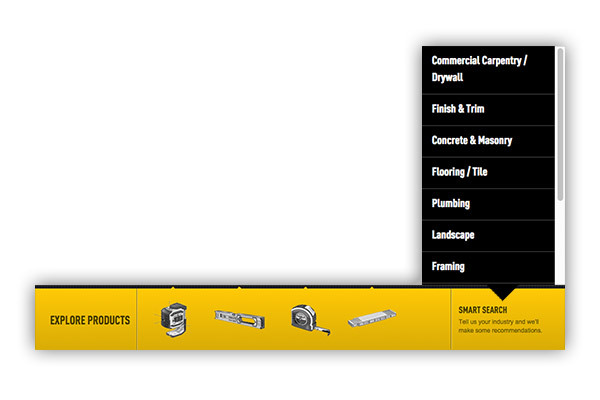 The Smart Search is also anchored to the bottom of every page, but allows for search by industry. 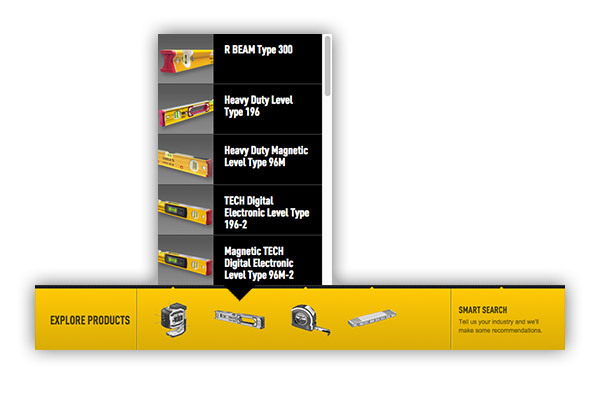 Based on the industry selected, recommended products for each job are displayed. 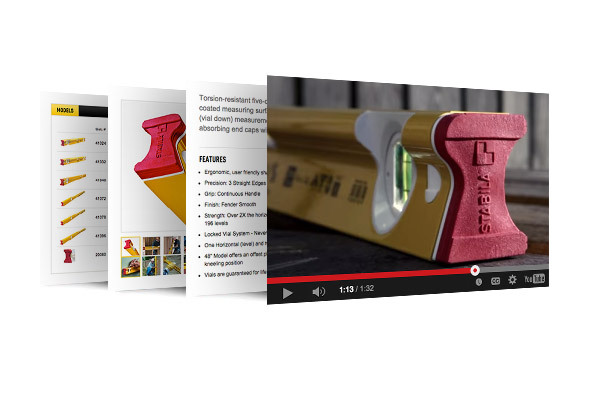 This allows a potential client to see all relevant products for a project in just a few clicks. Stabila has a comprehensive distributor network of Certified Dealers and Certified Full Line Dealers, and they encourage their professionals to purchase within this network of dealers. To facilitate this connection, L2 Interactive utilized the Find a Dealer tool, which locates all available dealers within a given area code.